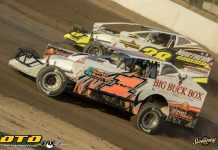 PORT COLBORNE, ON – Past track champion Greg Panunte from Port Colborne, Ontario celebrated his second Harvey’s Swiss Chalet DIRTcar Sportsman feature of the 2018 season on Rankin Construction Night at the New Humberstone Speedway. For the second time in his career and first since 2012, St. Catharines, Ontario driver Cody McPherson was crowned the 2018 Harvey’s/Swiss Chalet DIRTcar Sportsman track champion. Tonawanda, NY pilot Matt Farnham drove away from the field to win his first career Action Sprint Tour presented by Racerivalz.com A-Main. Dave Bailey from Hagersville, Ontario won his sixth JC Auto Thunder Stock feature of the season. Olivier Larocque from Port Colborne, Ontario won his fifth Cosco Haulage Mini Stock feature of the season. Mitch Dumont from Welland, Ontario won his ninth Mike Knapp Ford Pro 4 Truck feature of the season. Greg Panunte and Tyler Puchalski were on the front row and led the Harvey’s/Swiss Chalet DIRTcar Sportsman to the green flag for their regular season finale with Panunte showing the way early on. 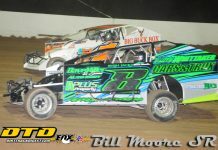 Cody McPherson battled with Adam Leslie for third place early on with Leslie taking over third from McPherson. Adam Leslie would take second place away from Puchalski on lap five and would close in on race leader Panunte. Rouse, McPherson and third-place runner Tyler Puchalski battled for several laps for third place. Meanwhile, Leslie would catch Panunte with seven laps to go and would battle for the win. Panunte would be able to hold off Leslie to score his Humberstone victory of the season. Race number nine of the 2018 Action Sprint Tour presented by Racerivalz.com was brought to the green flag for their 20-lap A-Main by modified pilot Matt Farnham and Paul Klager with Farnham showing the way. Aaron Turkey and Shone Evans battled for third for several circuits with Evans holding off Turkey for the final spot on the podium. With Farnham out front, he went over the edge, allowing Klager to reel in the leader. Off a lap 13 restart, Farnham would start to pull away from Klager, with Evans, Turkey, and Josh Hansen racing inside the top five. Farnham would lead all 20-laps to win his first career Action Sprint Tour A-Main in his first career start in a sprint car. 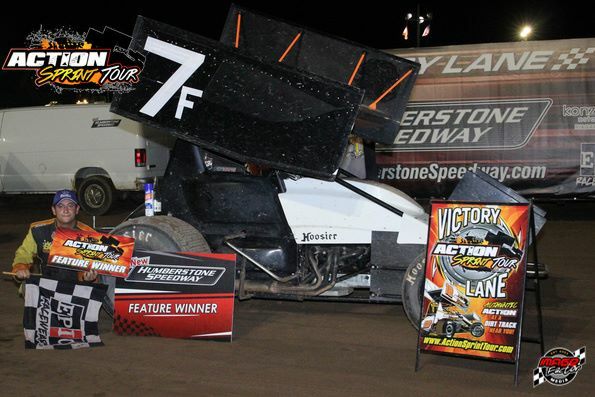 “It is totally different driving a sprint car”, commented Farnham in victory lane. 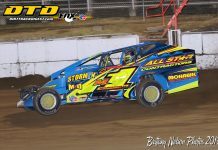 “I’ve had experience at Humberstone in the Sportsman and I cannot thank Trey Hoddick, Scott Kreutter and my crew enough for this opportunity” Farnham continued. The JC Auto Thunder Stocks was brought to the green flag for their 20-lap feature event by Billy Bleich Jr and Pete Reid with Reid showing the way. Jason Fontaine and Dave Bailey battled for fifth place. Bailey would move into the top three and then go after the duo of Bleich and Reid. Bailey would take the lead away prior to the halfway mark. After a lap ten restart, Bleich would regain the lead from Bailey. Bailey would retake the lead on lap 13, as Jason Fontaine would take second away from Bleich on lap 15. Bailey would go on to score the win, his sixth win of 2018. Cole Hardy and Dan McKay shared the front row in the 20-lap feature for the Cosco Haulage Mini Stocks with Hardy in the lead with Olivier Larocque and Jay Moulton racing in the top three. Larocque would close the gap on race leader Cole Hardy, but Hardy would be able to pull away from the field. Olivier Larocque would take the lead away after a lap 15 restart and would hold off Hardy and Evan Curtis to get the win, his fifth of the season. Dylan Llord and Danny Wurster were on the front row for the 15-lap main event for the Mike Knapp Ford Pro 4 Trucks with Llord showing the way. Mitch Dumont would take the lead away from Llord on lap four. After a late race caution bunched the field up, Mitch Dumont would hold off the challenge of Llord to get his ninth feature win of the season. 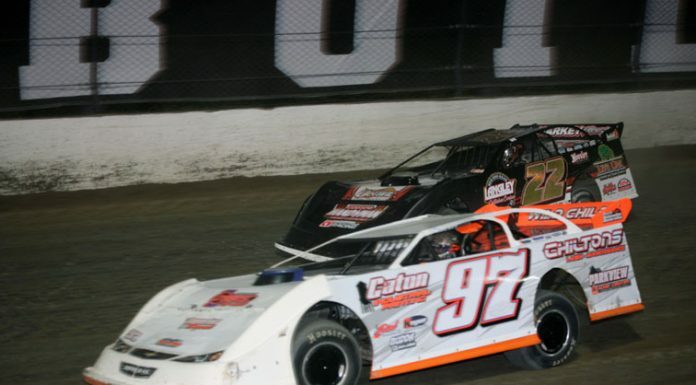 Racing action continues next Sunday night, September 9 as the Sportsman Super DIRTcar Series will be making their annual appearance for the Trevor Wilkens Memorial. Mike Knapp Ford will present the racing action that will also be Season Championships for the Late Models, Thunder Stocks, Mini Stocks, and Pro 4 Trucks. Also in action will be the third and final Eve of Destruction Enduro Qualifier, with the winner being a guaranteed starter for the Eve of Destruction. Showtime is at 6:30 pm. All kids in attendance can check out the activities with the Humbee’s Kids Club happening at 5:00 pm each race night on the second floor of the VIP Tower. Next article2018 Season Champions Are Now Crowned At Cornwall Motor Speedway!